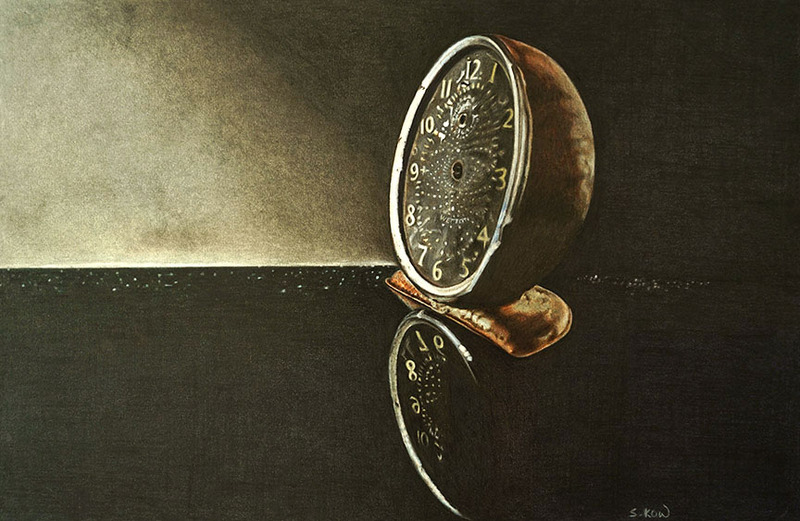 Time was, is, will be? What is time? Does it even exist? Have you ever wonder? To me, TIME is a big mystery. Since the day we were born, our life is measured and controlled by time. Everything we do now, past and future are all based on time. Is it a good or bad thing? Once in a while, I love doing super colourful subjects just to relax the mind and eyes or just for the heck of it. Rooster, is one of the subject that I have not done and never crossed my mind to paint it. I find painting chickens and birds difficult because of the lack of expressions. But I do love looking at their gorgeous feathers. The idea came about quite suddenly when I was looking for references. 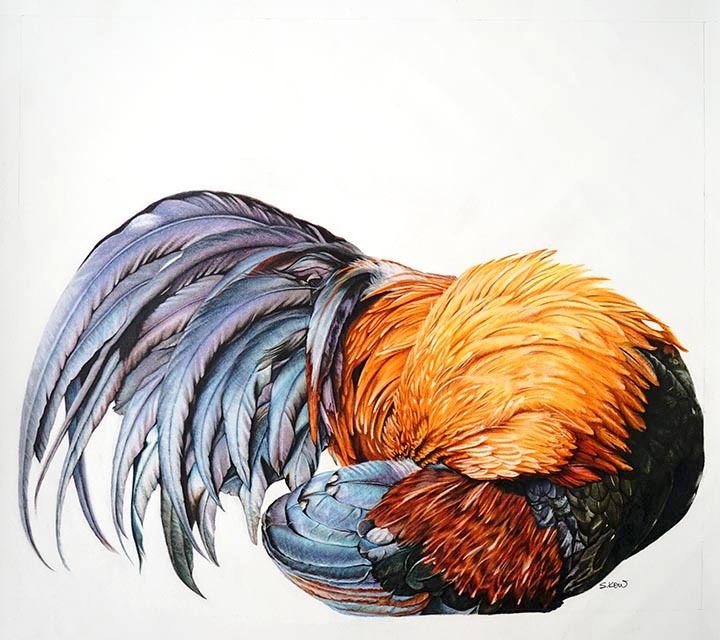 I recalled seeing a group of chickens roaming freely at a temple on a hilltop where I used to cycle to some time back and I have always been fascinated by their shiny colourful feathers, especially under the bright sunlight. Now, this is a very interesting subject. The subject itself is very symbolic. Family. The keys represent the individual in a family. Different types of keychains, various knick knacks attached to it. From there itself, one can roughly guess which key set belongs to whom, the father, mother, older/younger siblings. This is a wooden key holder hanging in my dining area. 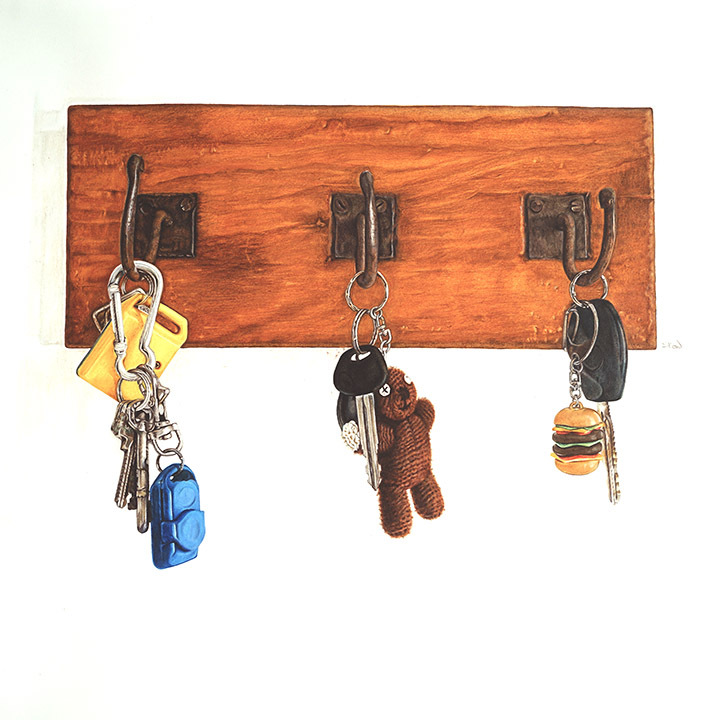 In this painting, all the hooks were occupied, showing that everyone is home. It can be where everyone is home at the end of the day, a weekend or a holiday. It is a very simple subject, very straight forward but you will feel a sense of warmth, love in a family. Equanimity – calm, composure, presence of mind, serenity, tranquility. 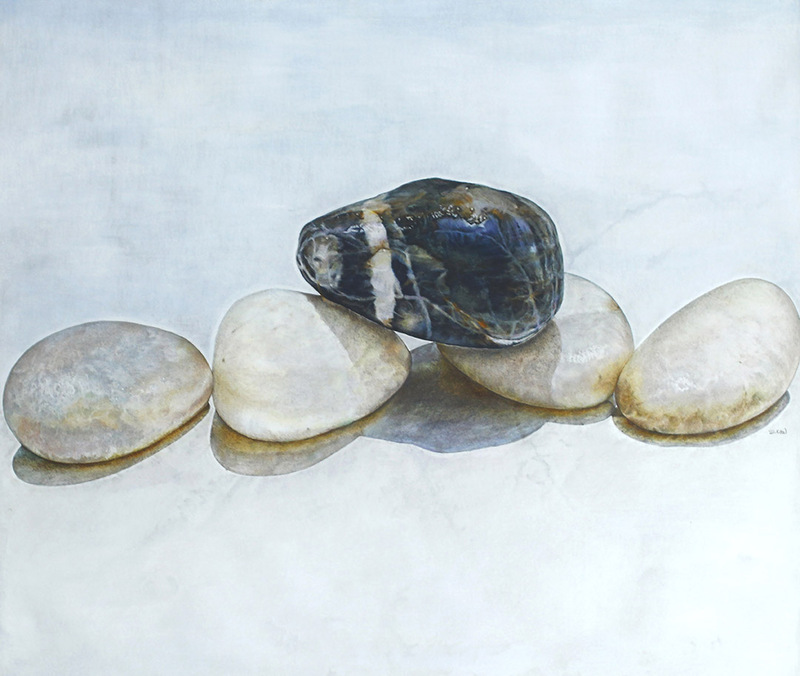 As shown in several of my work, rock/pebbles seems to be one of my favourite subject. I find them very versatile, both in paintings and expressing human feelings metaphorically. They can be intense yet subtle at the same time. With this piece, I wish to portray a sense of tranquility yet complex at the same time. At a glance, the whole composition looks calm and serene. But take a closer look, you will see so many muted colours and textures in every individual rocks. Just like us human beings, we are unique in our own way. If we as a society are able to practise tolerance, understanding and respect for each other, no matter how different we look or difference in belief and creed, we CAN co-exist peacefully. Imagine a world where everyone look and think alike, scary isn’t it?